We’ve picked ten of the exciting events taking place in France this year to get you started on planning your next French adventure. With celebrations for food, culture, music and art, and iconic sporting events, you’re sure to see something on the list that you won’t want to miss! The annual Kite & Wind Festival at Chatelaillon-Plage is a family favourite with lots to see and do over this long weekend in April. It’s a real spectacle to watch hundreds of kites of all shapes and sizes take to the skies in colourful displays and you can even watch competitive events including the Japanese sport of kite fighting ‘Rokkaku’ and have a go at making and flying kites of your own! There are hot air balloon rides, land sailing, mountain boarding and kite surfing on the beach too. Don’t miss the beautiful illuminated night flying displays. This incredible event sees Nimes Amphitheatre back in service hosting a traditional Roman Games! Take your seats to watch gladiators, chariot races, processions and parades in a spectacular show all the family will love! Over 500 actors come from all over Europe to create the show and the whole city gets involved with fringe events, Roman weapons workshops, museum tours and markets and street theatre reflecting the main event with this year’s theme being ‘The Barbaric Kings’. Commemorating the historic events of the Second World War and the 75th anniversary of the liberation of France on 6th June 1944, this exciting festival offers over 80 events at sites all along the famous beaches. Highlights include vintage celebrations showing vehicles, costume and entertainment from the 1940s, battle reenactments and parachute displays, concerts and fireworks and a whole host of tours and experiences where you can follow in the footsteps of the soldiers who fought here and celebrate at parades and street parties. For a full itinerary of what’s on visit the website and plan your trip! Music lovers are in for a treat when you visit this wonderful celebration of Jazz in all its forms. The line-up includes traditional New Orleans jazz, modern electro-jazz fusion and everything in between! Around 35,000 people flock to see world class performers playing in 60 concerts spread over seven stages and eight days. Music is all around with street performers and fringe events everywhere you look, and a fantastic party atmosphere. The historic 24 Hour race at Le Mans has been happening annually since 1923 and it’s a wonderful opportunity for motorsports fans because the 13km race route includes sections of public roads making it easy to get a track side seat to enjoy the action. See the latest innovations in the ‘Prototype’ category and the prestigious ‘Gran Turismo’ cars as they compete in this unique spectacle of endurance for man and machine. 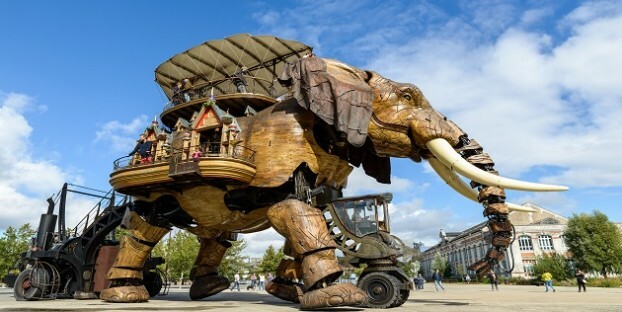 This summer event is a trail of discovery where you can explore modern art installations throughout Nantes. Reflecting themes of poetry and travel the artworks are positioned to create a dramatic statement standing out against the urban landscape. It’s an excellent chance to explore the city with over 30 stops on the route taking in sites including the famous ile des Machines, historic buildings, memorials and landmarks. A green line on the ground makes it easy to find your way and nearly all of this fun family trail is completely free to access. The most famous cycling event in the world comes around again in July with the 2019 route starting in Belgium and snaking down the East of France through the Alps and back across central France to the Pyrenees in the South West before final stages through Provence and the traditional finale in Paris. The race is around 3,500km long and provides lots of opportunities for fans to get a great view of the action from the roadside. The towns and villages along the route are swept up in the excitement offering festivals and events to go alongside the cycling action – plan your trip and experience the amazing atmosphere for yourself! This huge festival attracts over 800,000 visitors who come to enjoy the celebration of Breton culture and the Celtic heritage of Northern Spain, Scotland, Wales, Ireland, Cornwall and the Isle of Man. For 10 days and nights Lorient is filled with concerts, shows, markets, parades and so many different events to showcase the art, theatre, music, dancing, costume, reenactment and traditional games of the Celtic world. It’s educational and fun, great for families and a must-see if you’re going to be holidaying in the region next August! Don’t forget if you book self-catering accommodation or a B&B with us you can get 20% off the cost of your Brittany Ferries crossings, so browse our portfolio of properties and find a lovely place to stay near your favourite 2019 events!